Ok, if you’re looking for a cute, fun, easy, yet romantic gift… I’ve got something to show you. I have recently been introduced to freezer paper stenciling. Yes, it’s been on my to-do list for quite a while and I’m finally getting around to it. There’s a little more technique to it that I thought there would be… or maybe I’m just dumb. In any case, I plan to do a little more practicing with it. It’s pretty cool. 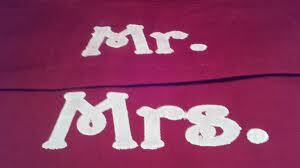 On to the gift idea: Make personalized pillowcases! And it’s way easier than it sounds. I used the freezer paper and fabric paint option. If your sewing machine can do monogramming, that would be way cool. Unfortunately, mine does not do it automatically and I don’t have a lot of practice with monogramming, so it usually turns out crooked and messy. Hopefully, I can upgrade someday or just get better at it. 1) Get your pillowcases and paint. 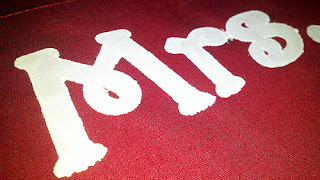 I used cheap pillowcases from Wal-Mart and “Velveteen white” fabric paint (from Michael’s). Wash your fabric first. You’ll get better end results. 3) Cut your design out on the freezer paper. I used my Cricut to cut it. An exact-o is also a more pain-staking, but completely plausible, option. The SHINY side of the freezer paper goes DOWN when you cut. If you are doing words, make sure your paper is facing the right direction. If you don’t, your words will be backwards. 4) Iron the shiny side down onto your pillowcase. SHINY SIDE DOWN!! Or you will have a huge mess to clean up off your iron. Not fun. 6) After it’s totally dry, you can heat set the paint by ironing over it again. Put a paper towel between the iron and the paint for no-mess. 7) Fill pillowcase with a pillow and enjoy sweet dreams on your personalized little fluffy cloud. I’m here from FTLOB. You’ve got a really terrific blog. I’ve enjoyed scrolling through your posts. I wish I were as creative. So fun! Would make a great wedding gift too. I love this, I have EVerything I would need in my craft room, but I’ve never heard of using the freezer paper for a stencil and I’m very inspired. I love this idea b/c my husband says I always steal his pillow. Cute idea! I need to upgrade my machine to a better embroidery machine too. It turned out great though with just the paint. I’ve been meaning to try freezer paper stencil too. Got to quit putting it off. This is really cute! I love personalized gifts!